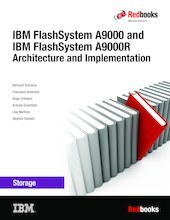 This IBM® Redbooks publication presents the architecture, design, concepts, and technology that are used in IBM FlashSystem® A9000 and IBM FlashSystem A9000R. FlashSystem A9000 and FlashSystem A9000R deliver the microsecond latency and high availability of IBM FlashCore® technology with grid architecture, simple scalability, and industry-leading IBM software that is designed to drive your business into the cognitive era. The Hyper-Scale Manager highly intuitive user interface simplifies management. Comprehensive data reduction capabilities, including inline deduplication and a powerful compression engine, help lower total cost of ownership. With software version 12.3.1 and Hyper-Scale Manager version 5.5.1 (or later) the system can compute reclaimable and attributed capacity information, without performance impact. From a functional standpoint, FlashSystem A9000 and FlashSystem A9000R take advantage of most of the software-defined storage features that are offered by the IBM Spectrum™ Accelerate software, including multi-tenancy and business continuity functions. FlashSystem A9000 and FlashSystem A9000R supports HyperSwap and Multi-site High Availabilty / Disaster Recovery (HA/DR) configurations. This publication is intended for those individuals who need to plan, install, tailor, and configure FlashSystem A9000 and FlashSystem A9000R. IBM Spectrum Accelerate Family: Host Attachment and Interoperability, SG24-8368.